See the ordinary world in a new and magical way with my images.Â I always love seeing this image!Â Here you can have it in your home as napkins.Â Thank you! Night lights reflect on the sidewalks and streets after a rain. Buildings have blue neon lights that spill out of the shop windows. Shimmering streaks and reflections are white, black, gray as they make the town look magical. 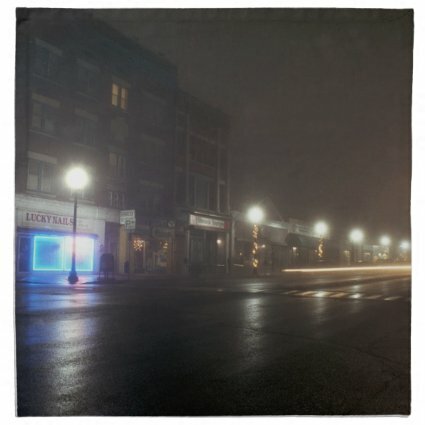 A viewer, who recently attended Susanâ€™s “Night Light” series exhibition, was so taken by how she captured Main Street of his home town that he felt compelled to say, “Susan makes Greenfield look like Paris, France.” This image entitled Streetscape IV was one of the images included in that series. This beautiful fine art photograph will enhance any place your home or work place. For more beautiful products from my Zazzle shop, please go to http://zazzle.com/SusanElkin.